As a professional performer, what you are selling or marketing, is yourself. Check out my new head-shots! Listen to my new demos! Look at me! Hear me! Hire me! I’m the best! IT’S ALL ABOUT ME!!! Ugggggghhhh. Within minutes of meeting some people in our industry, I immediately start to get the “what can you do for me” vibe, the sensation that the person is only half listening to me and already calculating in his or her head how well connected I might be, how I might be able to refer them or otherwise connect them with someone I’ve worked with or know, etc. Sadly, this “all about me” syndrome is a fairly common affliction amongst some very talented and otherwise perfectly nice people. The more sly ones find a way to offer me something in order to get something back from me. Here’s the thing: When you give selflessly, you get back tenfold, but if you are giving for the purpose of getting something back, you are doing it all wrong. There is no greater joy than feeling profound gratitude for what you already have, and experiencing the selfless act of giving. I am a part of the Voxy Ladies, a group of professional female voiceover actors who also happen to be serious do-gooders, which is what attracted me to the group. I met them at a book donation event for BookPALS, and I was immediately drawn to this group of ladies who choose to use their collective voices for good on a regular basis. Today I picked up the Halloween costume donations at Lotas Productions that the Voxy Ladies organized. (You can read more about that here.) Seeing that huge box completely full of costumes almost made me cry tears of joy. Jim Kennelly, the founder of Lotas Productions, has something he says to me at some point in the conversation every time he sees me: “What can I do for you?” The way he says this makes me smile. You can tell that he genuinely hopes to be of help in some way. It is the exact opposite of that unspoken “what can you do for me” vibe that plagues our industry, and the opposite energy as well. Today, I immediately replied that he had already been incredibly helpful with our costume drive. Then I remembered a friend in need… so I asked him if he happened to know of any good union actors who could deliver a line in a specific way. My friend, who I had just seen that morning, needed this voice right away for a TV show. Lo and behold, Jim had two actors coming to the studio momentarily that fit the bill! He even offered to record each of their voices doing a brief audition for my friend! Thank you, Jim! We helped children, we helped a friend, and I went home feeling high! When you offer to help others on a regular basis, it becomes a part of who you are. You become a better person, which makes you instantly more attractive to others, and to yourself. You feel good about yourself in a way that surpasses any career accomplishment. The good things that happen in your life as a result of your selflessness come as pleasant surprises that only further add to the initial joy of helping. I hope this inspires you to selflessly help others. And I hope that you too experience that awesome high, that warm wonderful feeling that is its own reward. 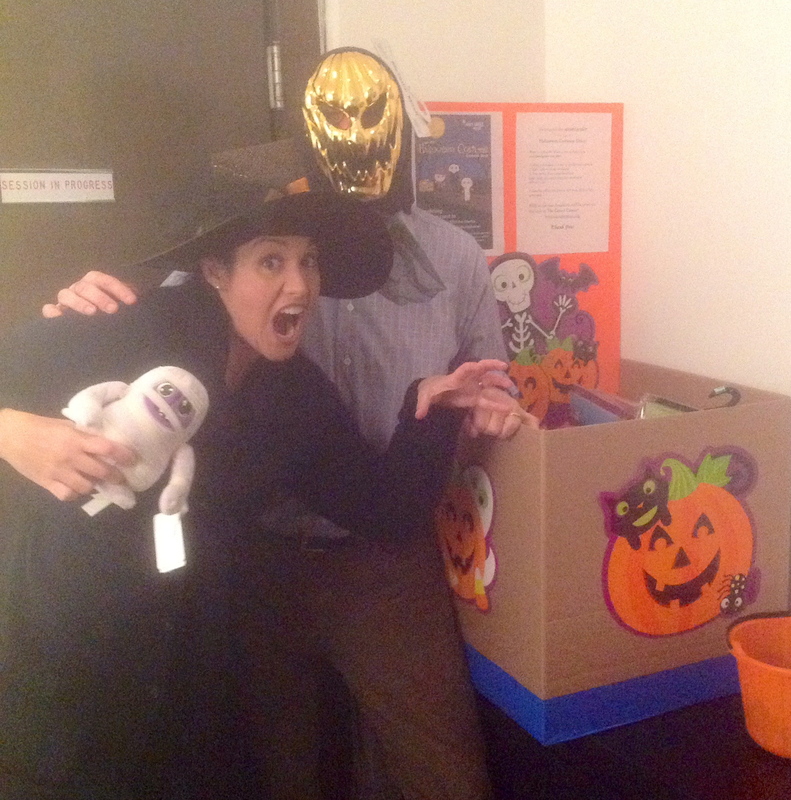 Jim Kennelly and I goofing off with our costume drive collection box. Special thanks to Marion and Dylan at Lotas Productions for their help as well with our Halloween Costume Drive!